We’d love your help. Let us know what’s wrong with this preview of Quest for Redemption by Sheri Velarde. Zanna is an elven warrior princess, who seems to have it all, yet really has nothing. Her fate is not in her own hands. Instead, it is bound to an ancient magic she has no control over. She wants to rule the elves, yet must prove herself worthy before she is accepted. She also wants to find her mate, but after two thousand years, didn't hold much hope. Her existence has be Zanna is an elven warrior princess, who seems to have it all, yet really has nothing. Her fate is not in her own hands. Instead, it is bound to an ancient magic she has no control over. She wants to rule the elves, yet must prove herself worthy before she is accepted. She also wants to find her mate, but after two thousand years, didn't hold much hope. Her existence has become mundane, and she craves something new. A routine assignment suddenly turns into something bigger that could ruin all of them. Is she strong enough to save the world and find her own happiness too? Can she change and help change the fate of the world with her? To ask other readers questions about Quest for Redemption, please sign up. "Quest for Redemption," by Three Worlds Press author Sheri Velarde is a fantasy quest novel about an elven warrior princess who must do battle with the most challenging of all enemies: herself. When we meet Zanna, she's bored and worried. Will she ever have a chance to prove herself worthy to take over her father's throne? Will she ever find her one true mate? The special family magic in her blood controls the fate of her love. 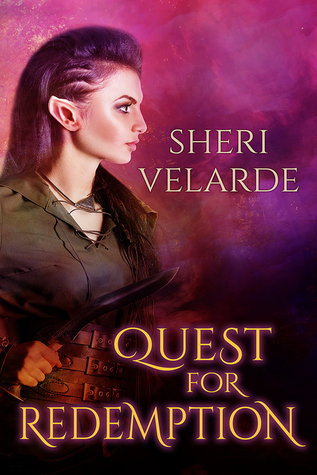 There is only one perfect love out there for her, and after a couple "Quest for Redemption," by Three Worlds Press author Sheri Velarde is a fantasy quest novel about an elven warrior princess who must do battle with the most challenging of all enemies: herself. When we meet Zanna, she's bored and worried. Will she ever have a chance to prove herself worthy to take over her father's throne? Will she ever find her one true mate? The special family magic in her blood controls the fate of her love. There is only one perfect love out there for her, and after a couple thousand years with no signs of him, Zanna is more than ready for the magic to kick in. When a Sprite is found teaching magic to humans, Zanna is dispatched to exact justice on behalf of Elven Law Enforcement, but the mission she discovers is not the one she set out for. Only in battling her inner and outer demons will she reach her goals. Quest For Redemption Author Sheri Velarde. Review - Quest For Redemption by Sheri Velarde is the first fantasy book I've read by this author and I will be looking out for other books by her. I found this novel to be a very magical read filled with mystical creatures and elves as well as other realms to travel. The book itself is about Zanna an elf who is trying to fix the magical mishap in her realm while also holding out on finding her true mate. I thought this novel had some very likeable and Quest For Redemption Author Sheri Velarde. The book itself is about Zanna an elf who is trying to fix the magical mishap in her realm while also holding out on finding her true mate. I thought this novel had some very likeable and magical characters throughout the novel. I also loved some of their names they oozed a mystical feel to them in contrast to the human names. I enjoyed following Zanna's adventure as she discovered more about her realm and the realm/ words around her and there inhabitants. I l really liked how she changed and developed as her life changed with everything she discovered. I also really liked the cover of this book. I would recommend this book if you like magic, friendship, and romance. This book is a real credit to the author and I hope she writes more book like this one. Quest for Redemption a fantasy romance novel. The Elven princess, Zanna, must prove herself worthy of ruling her people. The Princess must make decisions that will be for the good of them all. Along the way she realizes that some things that were considered myths among her people are actually true. One of them is how she's destined to meet her true soul mate. Zanna meets Will in an unlikely place and situation. The sparks are instant between them. They are drawn to each other and can't stay away Quest for Redemption a fantasy romance novel. The Elven princess, Zanna, must prove herself worthy of ruling her people. The Princess must make decisions that will be for the good of them all. Along the way she realizes that some things that were considered myths among her people are actually true. One of them is how she's destined to meet her true soul mate. Zanna meets Will in an unlikely place and situation. The sparks are instant between them. They are drawn to each other and can't stay away from each other. The magic set forth by her ancestors ensured that once she found her mate she would know--and Will was it for her. They help each other solve some perplexities about the magic realm and the human one. They get through a lot to save their people and remain together forever. Their tale is unique and full of intrigue worthy of reading. Quest for Redemption is Sheri Velarde first full length fantasy romance, and she did a darned good job of it! I am already a fan of this talented author/artist, but this novel proves how versatile she can be. Sheri Velarde weaves a tale of an elven princess bored with her life. Then again, after 2,000 years of the same thing every day, I’d be pretty bored too. Zanna takes what should have been a routine job and uncovers dark magic at work. The romance between Will and Zanna is unique, as is the in Quest for Redemption is Sheri Velarde first full length fantasy romance, and she did a darned good job of it! I am already a fan of this talented author/artist, but this novel proves how versatile she can be. The romance between Will and Zanna is unique, as is the interaction between Zanna and the other characters. I must say I am instantly left wanting both prequels and sequels to this. I can’t wait to see if Sheri Velarde can continue her magic! Very inviting fantasy with elves, gnomes and dwarfs. A princess elf, Zanna, must lead her comrades in finding what is blocking the magical realm. She enters the human realm where she will encounter love, friendship and must unite the magical creatures to reach her goal in showing leadership and finding what is blocking the realm. The quest and answers takes you on a wonderful journey full of challenges for all those she loves. Love at first sight is always a great premise for a book. Having gone 2 millennium waiting for her "mister right", Zanna an elven warrior princess, is stunned to find out Will is only half elven and his father is an evil dark elf. A fast read as they open the magical kingdom to all the creatures that have a right to entry. Needing both her magical skills and Wills mundane skill of photography. It was enjoyable watching Zanna grow as a person and a soon to be leader. Loved this book I couldn't put it down! captivating it left me wanting more! !